I need to be able to send a HTML document out a serial port every 10 minutes. Do you have a products for that? You've created a configuration (using the "Green Plus" button in the main window and configured communication parameters (baud rate, number of data bits, flow control etc) in the data logger and can receive any data without communication errors. First of all you should prepare a HTML file. You may use an existing file or create a new one using a HTML editor. You need to install and enable the "File requests" plug in. This plug in allows to send requests to a port using data from a file. Please, open a configuration window of the File request plug-in (click the "Setup" button near a drop-down box fig. 1, pos.2). The dialog window will appear on the desktop (fig. 2). Select the "Read mode". 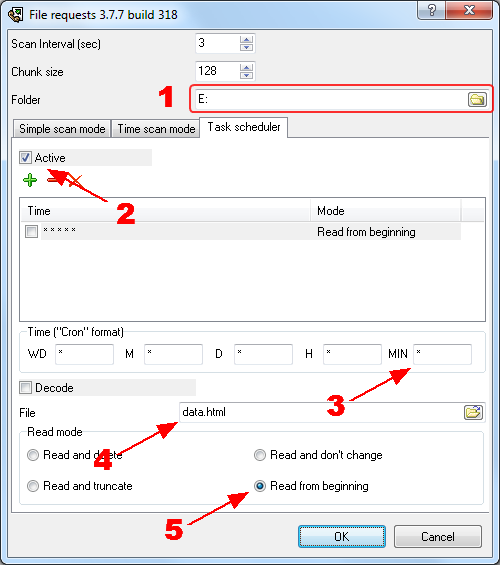 In this mode the program will repeatedly read a file and send it to a serial port.